Stepper motor divides a full rotation into a number of equal steps. Thus , motor's position can be commanded to move and hold at one of these steps, as long as the motor is carefully sized to the application in respect to torque and speed. This NEMA 34 Stepper Motor is a powerhouse when it comes to larger machines that require high torques. These are specially designed to withstand high torque requirements of large CNC machines. The NEMA34 122 kg-cm Hybrid Stepper Motor is a brushless dc motor which operates in Open Loop Control system. The motor shaft is customized and has a shape of 94-UP Mustang V. This type of shaft is useful in providing stability in high power operation. Very reliable since there are no contact brushes in the motor. Therefore, the life of the motor is simply dependent on the life of the bearing. 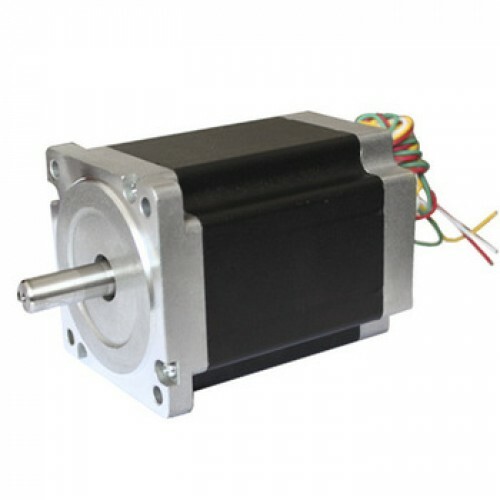 Checkout our collection of various types of NEMA17, NEMA23 & NEMA34 Stepper motors.